Applications are now open for PS 491: Public Defender Internship for Fall of 2018 and will be due on April 5. Read on for details about the course and the application process. Are you interested in how criminal courts work? Would you like to see an arraignment, a motion hearing or a real criminal trial? Want to meet with Public Defender clients about their cases? Would you like to help an attorney prepare cases for court? The Department of Political Science and the Champaign County Public Defender’s Office plan to offer an internship for academic credit in Fall, 2018. Jamie Thomas-Ward, the Director of Pre-Law Services, will provide academic supervision of these internships. Unlike other internships that require a substantial research project done in conjunction with the internship itself for an award of academic credit, in this internship, students will be awarded credit for their work in the Public Defender’s Office combined with a series of structured academic assignments requiring integration of internship experiences with readings on the political systems, the legal system and constitutional and human rights. This class requires one hour of class time per week, and about six hours per week of work at the internship site. What, specifically, can you expect to be doing as part of this internship? Other research and projects as needed. The Public Defender’s Office is a fast-paced environment. Ideal students for this program are: interested in criminal law proceedings; willing to take a variety of assignments; able to work independently when given appropriate support; and able to devote 90 hours during the semester to the Public Defender’s Office. Admission is competitive: We expect to have five openings for Fall, 2018. By Thursday, April 5, students seeking to participate in the Public Defender Internship Program must submit an application online at https://forms.illinois.edu/sec/7935624. The application consists of a cover letter, informal transcript, resume and writing sample. The cover letter needs to address each of the following elements: 1) explain your interest in and motivation for undertaking this internship, 2) share your experience in working with only a modest level of direct supervision, and 3) discuss your plans for accommodating participation in the internship in your schedule (including how many other credit hours you plan to carry, whether you will be studying for the LSAT, whether you have other significant time commitments). All of those materials will be reviewed for a decision on acceptance into the program by the departmental internship committee. At a minimum, students seeking to participate in this program need (1) to have completed 45 credit hours by Fall, 2018 (2) with at least one year of residence on this campus and (3) to have earned a cumulative UIUC grade point average of 3.0 or higher. They must (4) have completed PS 101: U.S. Government & Politics and (5) have no arrests or criminal convictions – as an adult or juvenile – or serious campus disciplinary violations involving campus or local law enforcement. In addition to work in the courthouse, students will need to attend a class for one hour per week on Wednesday afternoons at 4:00. Submit all applications online at https://forms.illinois.edu/sec/7935624. Past students have really enjoyed this opportunity. Questions on this internship? Contact Jamie Thomas-Ward at thomas99@illinois.edu. Still looking for some fall courses? As you know, students in ANY major can attend law school, and there are NO specifically required courses for pre-law undergrads. However, given an interest in law, here are some fall courses that pre-law students may find particularly helpful and interesting. These courses are only suggestions and are not requirements. Check out Course Explorer and speak to your academic advisor about the best courses for you. For more info on building academic skills for law school, visit the March 16 blog post. AAS 375/LLS 377: Prisons, Race and Terror. Examination of the U.S. prison regime, focusing on three dimensions of U.S. imprisonment — criminal justice, immigrant detention, and martial imprisonment, particularly under the War on Terror. FIN 214: Fundamentals of Real Estate A survey of real estate finance, appraisal, investment, law, brokerage, management, development and economics. Examines the Latina/Latino experience in the U.S. how and when the law, through the courts, has most often operated as an instrument of subordination and oppression, but has also at times been leveraged for positive social transformation. Students will come to understand that the law is a deeply contested social space that is central to U.S. social hierarchies based upon race, ethnicity, sexuality, gender, class, immigration status, and religion. PS 491: Internship with the Champaign County Public Defender’s Office Unlike other internships that require a substantial research project completed in conjunction with the internship itself for academic credit, credit in this program is based on class meetings and structured assignments that integrate readings on political systems, the legal system, and constitutional and human rights, with on-the-job experience summarizing case files, witnessing trials and colloquies, and interviewing witnesses and clients. Students are supervised by the Champaign County Public Defender or attorneys in the office. Stay tuned for updates regarding the application process for this exciting opportunity. 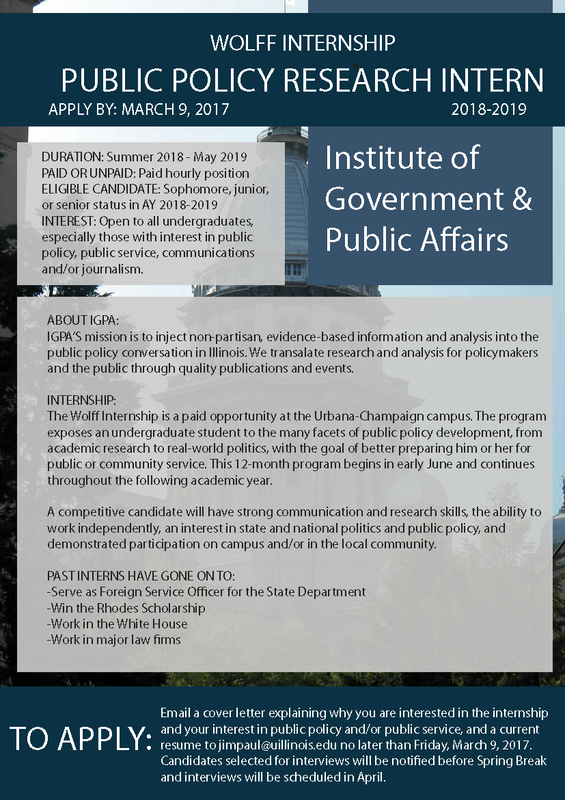 For more information, go here: https://pol.illinois.edu/academics/undergraduate-program/internships. Note – beginning in the Fall of 2018, the Political Science Department will be introducing a new curriculum, featuring concentrations in the following areas: General Political Science; Citizen Politics; Civic Leadership; International Relations; Law & Power; Public Policy & Democratic Institutions; and World Politics. For more information on these changes, go here. Welcome back! We hope you all had a relaxing and fun spring break. Keep reading to find out about some interesting programs, including PLAS’ “Taking a Gap Year…Or Two” set for THIS THURSDAY, MARCH 29, 5-6:15PM, ROOM 514 ILLINI BOOKSTORE BUILDING. 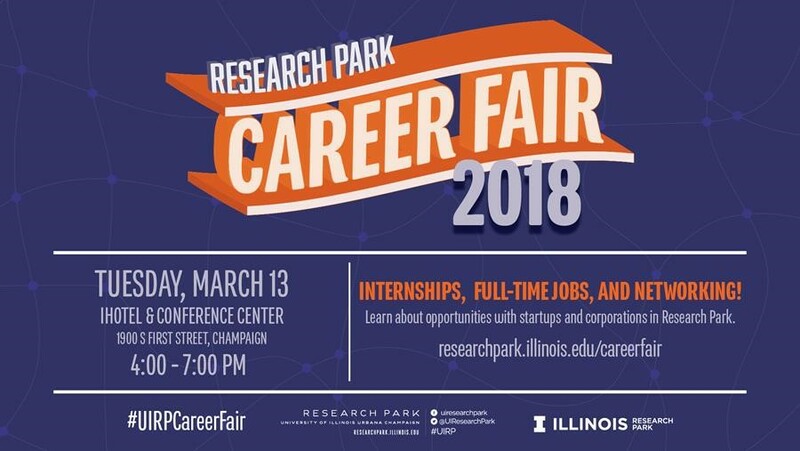 Scroll down for info on this, summer pre-law programs and internships with deadlines approaching (including one TODAY), the Illini Career and Internship Fair and more! Are you considering working, volunteering, traveling, or doing something else before attending law school? If so, how can you use that time effectively to improve your applicant profile? Do you want to know more about going straight through to law school after undergrad? This event helps students explore different paths to law school. The panel will feature three current law students–two with work experience and one who went directly from undergrad to law school–to answer your questions and discuss the pros and cons of going straight to law school versus taking a gap year (or more) and working. We will also discuss our overall applicant data and share more details about other paths our students and alumni have taken to law school. Whether you are planning to take time off or going straight through, this is a great event to clarify what to expect on your path to law school. Go here for more information on this event, as well as our upcoming PLAS workshops for Fall 2018 law school applicants! UIUC College of Law — Seeking Pre-Law Students to Serve as Mock Jurors! The College of Law invites pre-law students to serve as mock jurors for law students. Advanced Trial Advocacy trials will be held April 4,10,11, and 19 starting at 5 pm each night and lasting about 3 hours. Refreshments will be served. This is a great way to experience what it’s like to be on a jury, see what law students are doing, and get a taste of what trials are really like! Please email Thanin Stewart at tostewa2@illinois.edu indicating what day(s) you’d like to serve as a mock juror, or if you have any questions. The Career Center is excited to host State Department Midwest Diplomat-in-Residence (DIR) Melissa Martinez on March 26 & 27. Martinez is a media and communications professional with over 15 years of international and domestic experience in the U.S. diplomatic service. During her visit, she will provide guidance and advice on careers, internships, and fellowships in both the Foreign and Civil Service. The following events will all take place at The Career Center Interview Suite, Room 213, 616 E. Green St.
Have you ever wondered what it takes to be a U.S. Diplomat and represent the United States? Do you have a passion to serve your country? Join U.S. Department of State Diplomat-in-Residence Melissa Martinez to learn what steps you need to take to work on the forefront of diplomacy. Join us for a roundtable discussion with State Department Diplomat-in-Residence Melissa Martinez. Martinez will talk about the amazing experiences she has had with the State Department and offer advice on how students can pursue their own paths in foreign or civil service. Pastries will be provided! Sign up for a 10 minute one-on-one slot with Diplomat-in-Residence Melissa Martinez. These sessions are for students to ask specific questions about their interest in and application to the State Department. Office hours will be on a first-come first-serve basis; any remaining slots will be offered as drop-ins on the day of the event. Please arrive early to ensure your spot. Sign up here. State Department Diplomat-in-Residence Melissa Martinez will conduct a one-hour general information session to discuss internship and career opportunities including the Pathways Program, State Department Internships, and other opportunities to help you reach your foreign and civil service goals. Still trying to find an internship or a job? Scroll down to find out about some of the opportunities listed on this week’s schedule of events at the Career Center. Resume, Cover Letter and Linked In Reviews – Several times this week, beginning TODAY, March 26, 2-4:30pm, Career Services Center; 7-9pm, Undergrad Library, Consultation Corner. 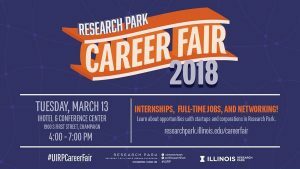 And don’t forget to mark your calendars for the Illini Career and Internship Fair, Tuesday April 10, 1pm-6pm, Illini Union Rooms A, B, and C! This career fair is open to all disciplines and is designed to serve as a “just-in-time” fair for students that have yet to secure a summer internship or full-time job after graduation. Classes for Fall 2018 – Registration Begins Soon! Unlike other internships that require a substantial research project completed in conjunction with the internship itself for academic credit, credit in this program is based on class meetings and structured assignments that integrate readings on political systems, the legal system, and constitutional and human rights, with on-the-job experience summarizing case files, witnessing trials and colloquies, and interviewing witnesses and clients. Students are supervised by the Champaign County Public Defender or attorneys in the office. Stay tuned for updates regarding the application process for this exciting opportunity. For more information, go here: https://pol.illinois.edu/academics/undergraduate-program/internships. National and International Scholarships Program – Introductory Sessions THIS WEEK! These short meetings are introductory sessions focused on how to apply for the national and internationally competitive scholarships listed below and briefly described on the attached handout. The application process for these awards begins over a year ahead of time, most starting this summer. We are offering this session eight times to accommodate your schedule. Come learn what you need to know about how to apply. Fulbright (130 countries), Rhodes (Oxford), Marshall (any UK University), Gates (Cambridge), Schwarzman (Tsinghua Uni. China), Knight-Hennessy (Stanford), Luce (SE Asia), Mitchell (Ireland), and Churchill (Cambridge). Tuesday, March 27: 3:30-4:00 & 4:00-4:30. Rm 514, Illini Union Bookstore Building, 5th Floor. Wednesday, March 28: 1:30-2:00, 2:00-2:30, 3:00-3:30 and 4:00-4:30. Rm 514, Illini Union Bookstore Building, 5th Floor. Thursday, March 29: 1:30-2:00, 2:00-2:30. Rm 514, Illini Union Bookstore Building, 5th Floor. Still looking for summer opportunities? We’ve posted lots of internships and jobs over on our Facebook page, like these. Summer 2018 LegalTrek Program — Applications due THIS FRIDAY, MARCH 30! Do you have dreams of being a lawyer? Are you interested in attending law school? If so, consider applying to LegalTrek. LegalTrek is a summer program designed to provide a hands-on, comprehensive overview of the legal profession to diverse college students. LegalTrek meshes traditional legal learning with opportunities to build legal skills. LegalTrek’s mission is to diversify the legal profession by encouraging and supporting college students from historically underrepresented groups to attend law school. We are seeking diverse applicants from racial/ethnic minority groups, as well as socioeconomically disadvantaged students, LGBT students and disabled students. LegalTrek 2018 is collaboration between the Chicago Committee for Minorities in Law Firms (Chicago Committee) and DePaul University College of Law. For more information and to apply, go here. The Division of General Studies is hiring PAID summer peer advisors to assist with summer registration. Visit our Facebook page for the full job description. The Career Center is hiring PAID summer interns to work 20-25 hrs/week May 14-Aug 3. Great opportunity for a student prepping for the LSAT this summer! Applications due TODAY, March 26. Visit our Facebook page for the full job description. Make the most of your spring/spring break! Here are suggestions for pre-law students and alumni to maximize your spring and/or your spring break. Apply to Summer Pre-Law Programs. These are typically 4 week residential programs to teach basics of law and how to prepare for law school, and most are free and come with a stipend for selected students. We have been posting these all spring on our blog and Facebook page. Take a look at the Summer Pre-Law Programs spreadsheet on our Compass page, listing over 40 summer programs, for even more opportunities. Note: Some deadlines have passed and others are April 1, so apply SOON. Taking the June LSAT? You should already have selected your prep option and started studying. Spring break is a great time to crank up your LSAT studying.Tip: REGISTER FOR THE JUNE LSAT NOW, because the popular test sites fill up around spring break each year. Taking the September LSAT? Now is the time to research LSAT prep options. Check out the LSAT Preparation folder over on our Compass page for information on free LSAT resources as well as listings of popular LSAT prep companies, including discounts they are offering to Illinois students. It’s still a good idea to decide who on campus can write your recommendations, and approach them by the end of this semester. If you wait a year or more the professor is sometimes gone, on sabbatical, retired, etc., so it’s better to get them now. Register for the Credential Assembly Service as listed above so that you can send the letters in to your account. 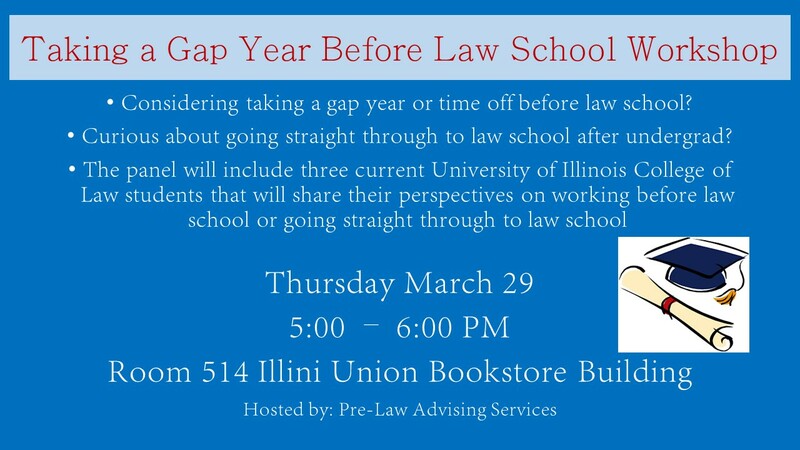 We will have a special workshop about Taking a Gap Year Before Law School on March 29 at 5 pm in 514 Illini Union Bookstore Building. This workshop will cover how you can maximize your postgraduate time to make yourself an even better law school candidate, and we will share a timeline and game plan for applying to law school as a working professional. Attendees will also have the opportunity to hear from current law students who worked prior to law school. Harvard Law School Junior Deferral Program Office Hours–Thursday, March 15 5-6 pm online. Harvard Law School recently began a program in which college juniors apply, and if accepted, they then enter law school 2+ years after graduating from college. Applicants must be graduating in Spring 2019 and commit to deferring their law school admission until at least 2 years after graduating from your undergraduate program. Applications are due April 1. HLS is hosting an online Info Session on March 15 to answer questions before the upcoming application deadline. Click here to register for the info session. Are you considering working, volunteering, traveling, or doing something else before attending law school? If so, how can you use that time effectively to improve your applicant profile? Do you want to know more about going straight through to law school after undergrad? This event helps students explore different paths to law school. The panel will feature three current law students–two with work experience and one who went directly from undergrad to law school–to answer your questions and discuss the pros and cons of going straight to law school versus taking a gap year (or more) and working. The Office of Admissions is hiring PAID summer I-STAR (student admission representatives) to work through summer registration. Applications due March 18. Click here for more info. The Office of Communications for Enrollment Management is hiring a PAID summer intern in the fields of writing, communication, or marketing, with the possibility of continuing through the academic year. Apply by March 19. Visit the Virtual Job Board for more info; look for Position 37333. The Career Center is hiring PAID summer interns to work 20-25 hrs/week May 14-Aug 3. Great opportunity for a student prepping for the LSAT this summer! Applications due March 26. Visit our Facebook page for the full job description. Waitlisted, or just waiting? What to do now! We’re hearing from a lot of law school applicants who have submitted their applications and now find themselves either waitlisted or still waiting to hear back. Here are some helpful tips and pointers to help you position yourself in the best manner for admission and aid! The school is essentially “wait listing” you, but not calling it that, by waiting to respond to you until they see the rest of the applicant pool. You applied later in the cycle and a backlog of applications must be reviewed before yours. What can you do if you are still waiting on an answer? IF it has been at least 4-6 weeks or whatever time frame the school has indicated for your file to be reviewed, reach out and politely inquire about anticipated time frames for a decision. Reiterate your interest in the school. Follow the law school on Twitter; many deans have taken to updating applicants about expected decisions there. Don’t: Complain about their slowness or criticize the school’s process; tell them you’ve already heard back from everywhere else or from “better” schools; give the school a deadline. Sometimes patience is key. If you’ve been waitlisted…Understand what this means: that you are an admissible candidate but the school needs to hit its institutional goals before they can admit you. Institutional goals could be LSAT/GPA related but could also be related to balancing the class with regard to gender, diversity, in state/out of state, age, etc. Very few schools can accurately predict how many applicants–and with what qualities–they will be pulling from a wait list. When the school tells you they don’t know your odds, it is very likely true. What can you do if you are waitlisted? Follow the school’s directions carefully. Do not email to ask them what to do after the school sends very specific instructions. Some law schools will ask you to confirm that you want to be on their wait list–if you don’t do so, you will not be considered. Pay attention to these details and instructions and follow them carefully. Visit the school if you haven’t already. Making a strong impression on an admissions professional can go a long way toward being selected when it’s time for them to pull from the wait list. Update your application by sending an updated resume, a new recommendation, or a letter or email expressing continued interest in that school (sometimes called a LOCI, or letter of continued interest). Stay in touch–no more than once every couple of weeks–to demonstrate your interest in the school. Keep them updated on your plans. IF the school is your top choice, then say so. Continue to make other plans. No one should proceed by “expecting” to be pulled from a wait list…even if this does happen, it can be anytime up to the day classes begin. You need to start making concrete plans in early April. Decide which law school you will attend out of those who accepted you. Make plans for putting down your deposit(s). Don’t demand a decision right now…you may get one but it will not be the one you want. Be “pleasantly persistent” as we move into April and May, which are prime decision-making times for schools as their deposit deadlines pass. And always remember that professionalism and good manners go a long way in this business! Thank you to the students that attended the Negotiating Scholarships Workshop last Monday! PAID internship opportunity! Wolff Internship applications are due March 9. Join OIIR every weekday for a noontime discussion, and learn something new. Featuring speakers, panels, and resources at the University of Illinois, all lunches introduce you to the cultures, histories, and societal issues that the diverse communities of our campus face. Programs take place from noon to 1 pm. For more information, click here. Professor Reichman will present “Reforming the Supreme Court of Israel.” His lecture is part of the “Distinguished International Lecture Series in Constitutional Law” sponsored by the College of Law’s Program in Constitutional Theory, History and Law; and Israel Studies Project.This event is free and open to the public. Creating Your Powerful Cover Letter, 4-5 p.m., The Career Center Conference Room 143, 715 S Wright St.
Finding an Internship, 5-6 p.m., The Career Center Conference Room 143, 715 S Wright St.
Health Professions Wednesdays: Beyond the Medical Model, 4-5 p.m., The Career Center Interview Suite 213, 616 E Green St.
Acing Your Interview, 4-5 p.m., The Career Center Conference Room 143, 715 S Wright St. Creating Your Powerful Resume, 5-6 p.m., The Career Center Conference Room 143, 715 S Wright St.
Immigration Attorney Presentation, 4-5:30 p.m., The Career Center Interview Suite 213, 616 E Green St.